PRICE FROM 700 E/M2 DISCOUNTS!!! Kavarna is lokated in the North-East sea side of Bulgaria.The city is 64 klm from Varna and it dispose of a small harbour,fishery base,spacious beach and a beautiful bay. 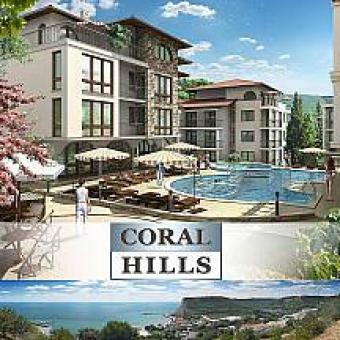 CORAL-HILLS is an inclosed type of complex only 300 mtrs from the sea coast. 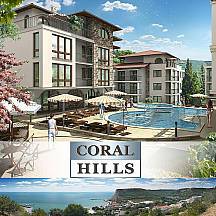 The complex consist of 4 buildings on 4 floors,shops,restaurant,big swimming pool,bawling and garages.You can choose between different floors and views,on the 4th floor you will even find a jacuzy on the balcony!